Maison Bleue is located in Prosser, Washington. Jon Martinez makes Rhône-style wines, both whites (Roussanne, Viognier, Marsanne, Chardonnay) and reds (Grenache, Mourvedre, Syrah). His winemaking talent is generating a lot of interest, and there are too many accolades and awards to mention. Suffice it to say, this winery crafts exceptionally good wine, and could easily charge more for their wines. (Did I just say that out loud?) The vineyard sources are in and around the Yakima AVA, including Snipes Mountain and Horse Heaven Hills. With so much press about these wines, the days of a $20 Maison Bleue beauty should be cherished and fully enjoyed while they last. Today’s Friday Find is the 2009 Jaja, a Yakima Valley Red Wine from Maison Bleue, 50% Grenache and 50% Syrah from Boushey and Upland Vineyards. Vibrant ruby colored in the glass, the Jaja Red is an all around beautiful wine. Mouthwatering scents of raspberry cream, bright cherry, and hints of Herbs de Provence rise from the glass. Initially, the flavors reveal tart red fruit and black plum, as earthier herb nuances and smooth tannins come into play as the wine opens up. A few wines I’ve recently tasted fall into a category I can only describe as having a certain “glass ball rolling around on your tongue” quality,more specifically defined as clarity and focus that are exceptionally expressed. Odd description, but it is meant as the best of compliments. Maison Bleue’s website provides a list of northwest retailers and restaurants where their wines have been available, although calling first would be wise. It cannot be confirmed nor denied that the supply at the Fred Meyer in Newberg, Oregon has curiously been dwindling as of late. Nice review, Tiffany. 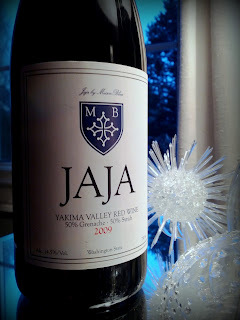 Finding '09 Jaja Red anywhere is a challenge, so the tip for the Oregonites is great! We scooped up a case of this about this time last year (at $16/bottle), so we're on the lookout (and on Jon's list) for the release of '10 Jaja Red. Even his higher end wines are (still for now) good value, compared to the rest fo the market, imo. Thanks Chris. Smart move on the case acquisition. I agree his higher end wines are a great value. Looking forward to what Jon has in store for us in the future.